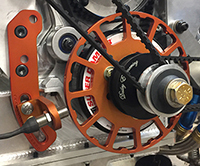 The EFI crank trigger assemblies are custom built high performance wheels, brackets and pickups for motorsports applications. The unique design features a precision machined billet 6061 aluminium wheel with magnetic inserts. The magnets are inserted radially to ensures the most accurate trigger pattern possible. Dimensions: 8.0" dia x 0.375"